We love the Wonder Pets! here at the Bingham household. For starters, my 2 year old loves it because the main characters are animals. My 3 year old loves it because they sing. My 4 year old loves it because she just does. And my 5 year old loves it because "they haf to build a ship every day" in order to save everyone. 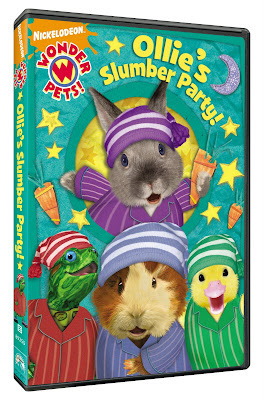 In their newest DVD, Ollie's Slumber Party, Linny, Tuck, and Ming-Ming are invited to an overnight party by their friend Ollie. Problem is, Ollie is SO! EXCITED! about having friends over that he can't get to sleep! So by working together, the Wonder Pets! dress up as sheep and have Ollie count them. Soon, Ollie is snoring. There are a few bonus episodes included on the DVD as well, for a total running time of 100 minutes. Save the Dancing Duck: Save the Dalmatian! Wonder Pets! is a great program for kids, especially the younger ones. It even won an Emmy in 2008 for Outstanding Achievement in Music Direction & Composition. The Wonder Pets! sing as they work together to accomplish the task. They help one another, and teach important lessons about cooperation, patience, and friendship. "What's Gonna Work? TEAM WORK!" The Wonder Pets! Ollie's Slumber Party will be released June 9, 2009. Get your copy here!